Do you remember the last time you turned down a free sample? You can think long and hard but we are certain that you probably won’t be able to think of such an incident. Which is completely fine because we, humans, LOVE free things. Getting individuals to sign up for free things is a hundred times easier than asking them to pay. That is why businesses offer free trials. Have you considered using trial marketing in your business to get prospects to sign up? 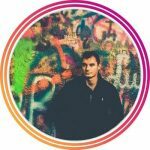 Trial marketing is a unique strategy that can help B2B companies get users to sign up for their service and test it out free of cost, serving as a lead generation tactic. There is nothing for the prospect to lose, as most of these free trials require just their contact information. So getting them to commit to the trial isn’t the hard part. The real challenge is convincing the prospect to sign up for the solution post-trial period. 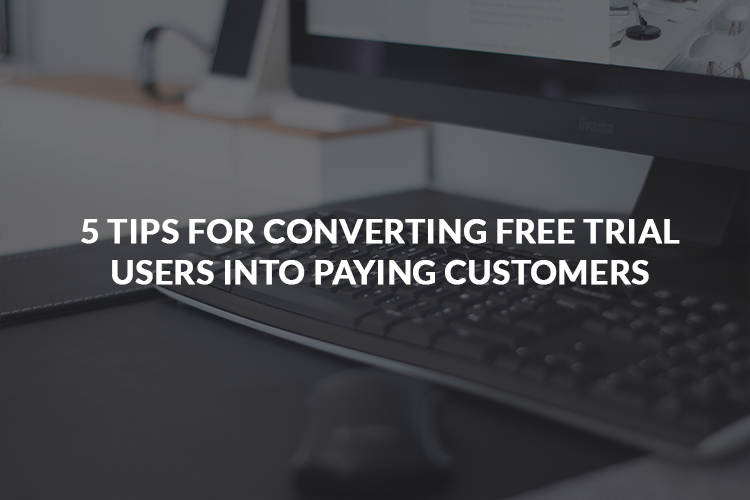 Keeping this challenge in mind, we have 5 tips that will help your business convert free trial users into paying customers. Free trial marketing strategy is becoming more and more popular especially with SaaS companies but isn’t just limited to them. While the number of sign-ups may be high, the real success of such a strategy can only be gauged by analyzing the conversion rate of free users to paid customers. Figures vary and usually range from 5-20% at most for the majority of businesses. At the same time, you will find businesses that know the art of trial marketing who convert at rates of a whopping 40-50%. Getting close to that conversion rate can really help transform your business. 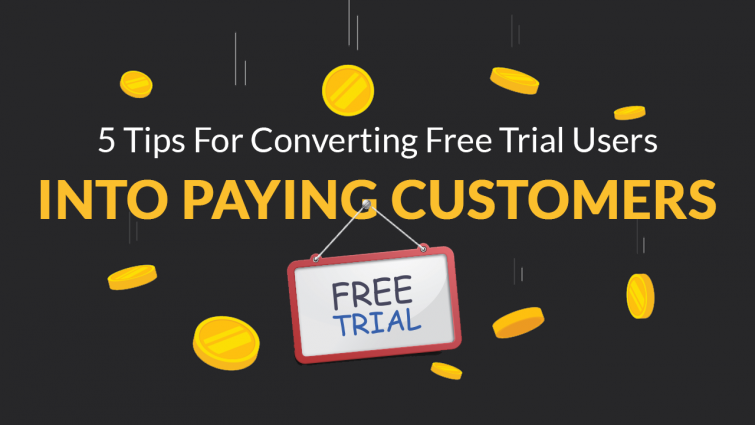 Before getting into tips for conversion, your business needs to focus on adopting the perfect free trial marketing strategy. After all, the more sign-ups you have more chances of sales. You can’t start any type of marketing campaign without knowing your target audience. The whole basis of the campaign, the strategies you employ is based on this. So the first thing you need to do is create your ideal customer profile. The profile will consist of firmographics, behavior tendencies, who the usual key decision makers are, and what the major pain points of your customers are. Based on this, you can design your approach and content to target your ideal customer profile. To create this profile, you can analyze your existing customer and even create a survey for them to answer. The survey will focus on questions that will give you insights into your customer’s company, so you can develop this profile. This will help you know exactly who to target with your free trial marketing strategy. Create a landing page, this will serve as your sign up page. Start posting blogs and linking the landing page to it. 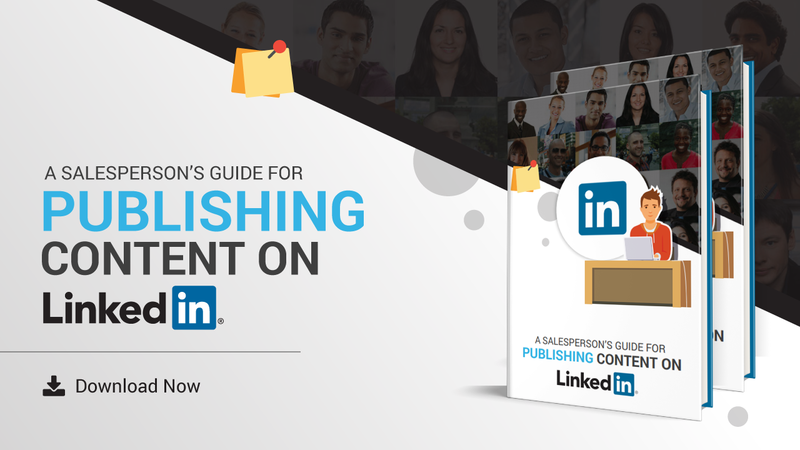 In your content, you need to make sure to use the right keywords and incorporate a call to action, so readers know exactly where to go to sign up. This step will help you generate leads for your free trial marketing. Don’t overcomplicate the sign-up form with too many fields. You want to keep it as simple as possible so prospects can easily breeze through the form. Complicated forms may put them off as they seem like too much of an effort to fill out. You can also use these forms to qualify leads, marketing to them accordingly. Kissmetrics suggests that you think wisely on the fields you put. They can help you segment the leads so you can market specific solutions that would be of interest to them. The simplest of sign up forms integrate social media sign-ins. This allows users to just sign in using their social media credentials and these credentials serve as their sign in details from there on. One common mistake businesses make with the sign-up form is to ask for credit card details. It is smarter to avoid this, let them use your solution and then if they want to pay later on they can provide their payment details. Most prospect will run from the sign-up form, once prompted to enter these details. Even if you clearly state that their card will not be charged, you are sure to lose sign-ups this way. 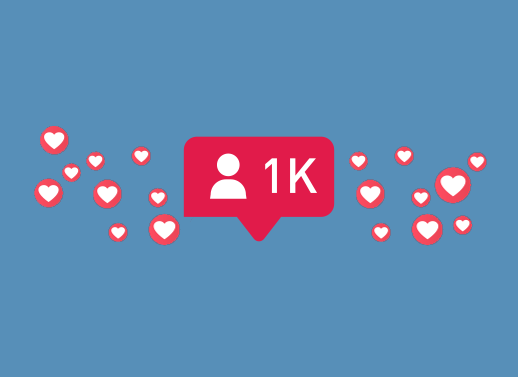 Following these three steps should have you well on your way to gaining a lot more leads from your free trail marketing strategy. 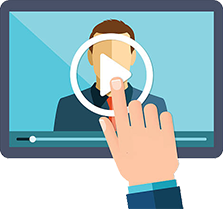 Now we can discuss the 5 tips that will help you convert these free trial leads to sales. To grab the attention of prospects and give them the sense of possibly missing out on something, urgency needs to be created within your trial marketing strategy. You want them to pounce on the opportunity to signup immediately for the free trial, otherwise feel left out or as if they are missing a once in a time opportunity. You can get their attention by using specific phrases like, “limited time only” and “sign up now and get a free 30-day trial.” Phrases like these will let them know that this offer isn’t going to last forever, so they should sign up immediately. This tactic also adds a sense of exclusivity, that they were the few who benefitted from such an offer and got a trial of your solution before purchasing it, since they opted for the “limited time” offer. 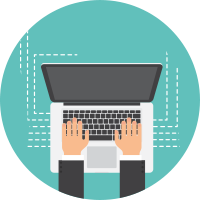 Once prospects sign up, you can let your solution do all the selling. You obviously have enough faith in your product to offer a free trial. Just make sure to polish it and work out all the kinks so it shines. The period you set the free trial also plays into the sense of urgency. We recommend offering either a 15-day or 30-day free trial. This gives the user enough time to slightly develop a dependency to your solution which should convince them to pay once the period is over. As the trial is coming to an end, the prospect usually starts to weigh the advantages and disadvantage, if any, of your product. They usually look for the slightest bit of kink in it to try to convince them to not opt for the solution, unless, your solution is perfect. But keep in mind most users will come up with one excuse or another. This is the time you need to sweeten the deal for them with a promotion. As you notice their trial period coming to an end, present them with an offer they can’t refuse. It can be a free added service, a discount, whatever you feel would be suitable for the user. With the help of promotion, you give them a sense that they would get more value for their money. But make sure to add a sense of urgency in the promotion also by adding a deadline to it. You can give them up to a week after their trial period to avail your services with the promotion. Spotify, the music streaming company, uses promotions very well. They offer a discount that gives up to 90% off for the users first 3 months of paid services. Asking for money, immediately after the free trial period is over can be difficult. Especially, if you left the user in isolation with your solution throughout their trial period. You want to nurture your relationship with the user during this time and the best way to do that is through an email campaign. You can devise a campaign that helps move the user along the sales funnel. Fom a free trial user to a paying customer. How you do this can have a major impact in your free trial marketing strategy. Make sure to send educational content to them such as tips, how to’s, and other insightful content that helps them understand your solution while adding value to their business. This way, they will be more likely to form a relationship with you and your solution. These emails will build a sense of trust between you and the user. Which should likely increase the chances of them opting for your service once the trial period has finished. You want to make sure that when the prospect signs up for your service, they are well aware of what they are signing up for. There are far too many cases of companies that end up confusing users because the content on their sign up page wasn’t clear. Which results in the user immediately opting out once the trial period is over. You should highlight exactly how long the trial period is and ensure that it is stated that post-trial a payment would be required to use your solution. Confusing the user will only give them fuel to not opt for your service. Just in case the user missed this information on your website. Be sure to also reiterate it in your “Thank You” sign up email. 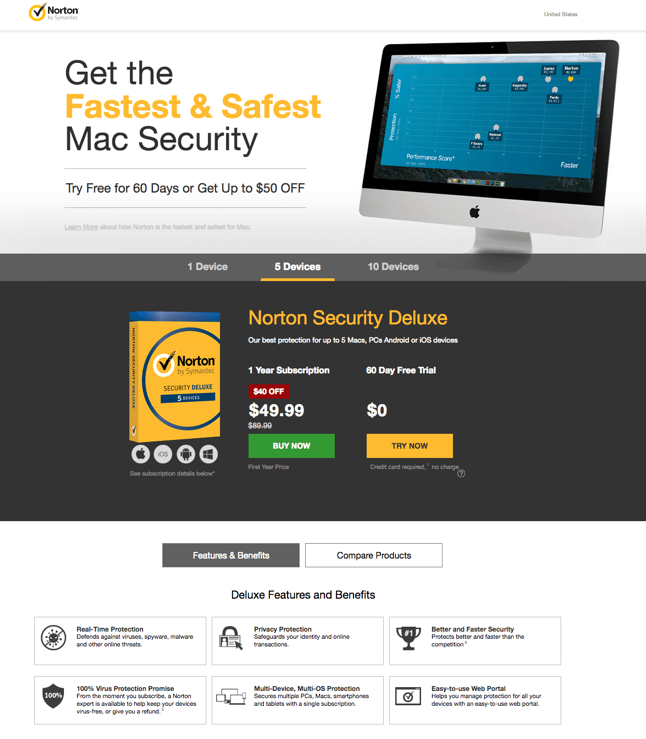 This sign up page by Norton is a classic example of how your free trial marketing content should be. It clearly states that the user will get a 60-days trial and what they have to pay after that. So the user knows exactly what they are getting into and how much they will need to pay after the trial period runs out. It also clearly highlights what the user would get if they opted for the deluxe services and how it would benefit them. So there should be no confusion at their end. As the trial period comes to an end, the user usually starts to think, why should I pay for something I once had for free? Which can leave some a bit agitated when you inform them that their trial is going to end. At this point, you don’t want to make it worse by asking them to go through a long, tedious process in converting to a paid customer. This will only fuel their agitation. Keep the process as simple as possible. For this, you need to reassess your transition process and see what steps could further agitate users. We have found that the simplest process is just asking them to proceed with the payment and once done, continue using the solution. Free trial marketing strategy is one that can lead to higher revenues for businesses when it is implemented properly. It allows your solution to sell itself. Through the trial, users should be able to understand how the solution adds value to their business, most will turn away from such a product. So make sure you have your sign up page and trial marketing, post-sign up, in order. Once you’ve implemented our tips, you should experience a drastic change in the conversion rate of free users to paid and the success of your free trial marketing strategy.